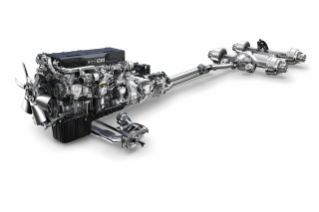 LOUISVILLE, Ky. – March 25, 2015 – Detroit Diesel Corporation has started production of the components that make up the new integrated Detroit™ Powertrain. The integrated Detroit Powertrain is on view at the 2015 Mid-America Trucking Show (Detroit booth #30155). The integrated Detroit Powertrain features the Detroit™ DD15® engine with a new downspeed rating, a Detroit™ DT12™ automated manual direct drive transmission and Intelligent Powertrain Management, and Detroit™ front and rear axles. Rated at 400 hp and 1750-lb-ft torque, the downsped DD15 engine shifts the usable torque range to lower engine speeds to reduce friction loses enhancing fuel consumption and improving reliability while allowing vehicles to be geared for lower engine rpms. The new six-blade cooling fan design also draws less power, so the engine doesn’t burn as much fuel. The proprietary Detroit Virtual Technician™ On Board Diagnostic System is also part of the integrated Powertrain solution. The DD15 features the 1-Box™ emissions package, and meets OBD13 and GHG14 standards. The DT12 automated manual transmission, with the powerful new Intelligent Powertrain Management (IPM), uses pre-loaded terrain maps and GPS to know the route ahead and automatically adjust transmission and engine function for a smooth and efficient ride. Mixed idle operation allows for 560 rpm creep mode operation to improve low speed maneuverability and 500 rpm for reduced fuel consumption during eCoast events. The 12 speeds and small step gearing combined with the efficiency of a direct drive top gear also leads toward its effective performance. Detroit now offers a 6x2 configuration with a 2.28 ratio that is specifically designed to work with the downsped engine rating, making it the fastest ratio available in Freightliner and Western Star trucks. The 6x2 Detroit axle configuration incorporates a non-driven tag axle on the tandem, reducing total weight by almost 400 lbs., while a new 2.41 ratio in its 6x4 axle configuration is also available for applications requiring additional traction. The integrated Detroit Powertrain is available in the Freightliner Cascadia® Evolution and the Western Star 5700XE. For more information, go to Detroit booth (#30155) at MATS or visit www.DemandDetroit.com. Detroit offers a complete line of heavy-duty diesel engines, axles, transmissions, safety systems and telematics products for the commercial transportation industry in both the on-highway and vocational markets. Detroit products are sold and serviced through a network of hundreds of locations throughout North America. For more information, or to locate the nearest Detroit location, visit DemandDetroit.com. Detroit™ is a brand of Detroit Diesel Corporation, a subsidiary of Daimler Trucks North America.